The U.S. has urged the world to ‚pick sides‘ in Venezuela’s constitutional crisis. Since last Wednesday, Venezuela has two presidents. 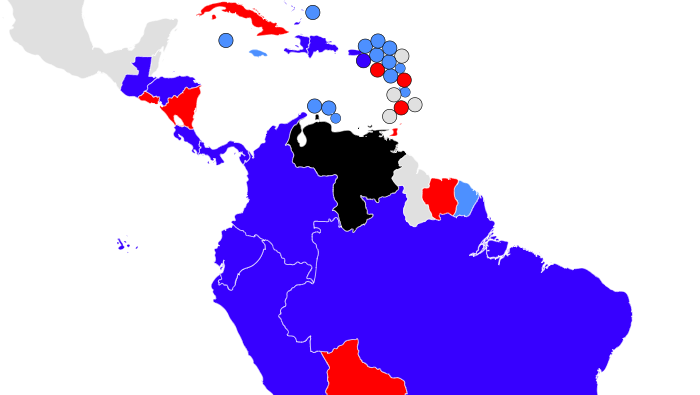 The world map above shows which countries (in red) support Nicolas Maduro, whose re-election last May many observers say was rigged; and which ones (in dark blue) support Juan Guaidó, the opposition leader who declared himself ‚interim president‘ last week. There’s something more going on with that map, however – something ominous about the two camps that have coalesced on it. These are not just two random groups of countries. These are two camps, with plenty of grievance and enmity between them. Some of the borders between both blocs are even active frontlines. 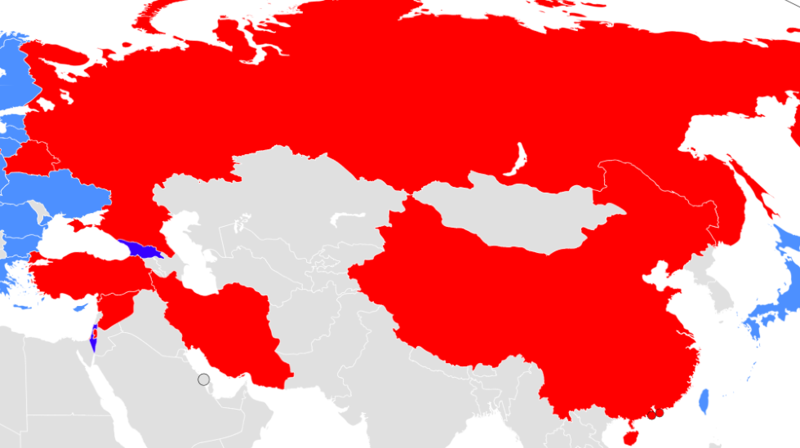 Could this be the outline of a new Cold War, or if cooler heads don’t prevail, a hot one perhaps? Most of Venezuela’s neighbors have recognized the presidency of Guaidó, but Maduro can count on the continued support of Cuba, Nicaragua and Bolivia, and a few others. All that for Venezuela’s sake? If that sounds ludicrous, think back to 1914. Few people back then could find Serbia on a world map, let alone understand what its beef with Austria-Hungary was about. How quickly that escalated into the First World War. Although the cause might have been obscure, the war itself was not a surprise. Decades-old rivalry between the great powers of that time had escalated into deepening enmity. The assassination of Franz Ferdinand on June 26 of that year set in motion a complex array of alliances and counter-alliances. Just over a month later, on August 4, German armies plowed into Belgium. Of course, history never repeats itself exactly. But there are patterns. Like the Balkan conflict in 1914, Venezuela’s constitutional crisis is a local power struggle with a global dimension. So what do both sides look like?